For those of you who like to shop and hang out in the Jerusalem neighborhood of Geulah, you are in for a different experience as modern nightlife has reached the yeshiva world. 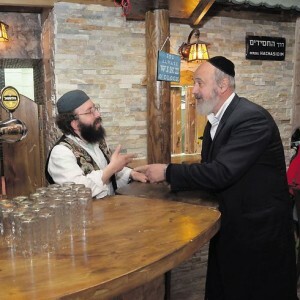 After converting from a restaurant to bar, “Kretshme”, the first ever Charedi bar, has opened. The bar is open every day until Midnight where it offers its guests chulent, beer, and other high quality alcoholic beverages. During the day, Kretshme is a full fledged restaurant and at night it turns into the bar. While the locals may not refer to it as a “bar”, yeshiva students and young couples definitely visit to take advantage of their beers and other alcoholic beverages.